By Srinivas Chowdary Sunkara // petrobazaar // 15th April, 2019. Brent rose 72 cents or 1.02% to $71.55 and WTI settled 31 cents or 0.49% up at $63.89 a barrel on Friday. Shanghai crude oil main contract futures slid by 4.2 Yuan or 0.88% to 475.2 Yuan/barrel where as MCX crude futures in India closed Rs.62 up at Rs.4451 on Last Friday. Both the global crude markers closed last week above 1 % high. 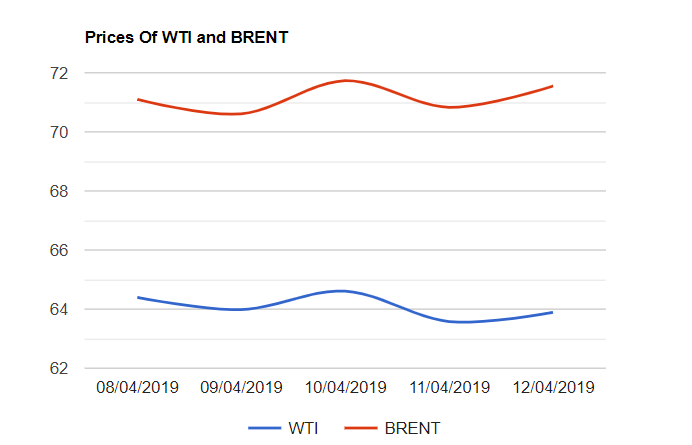 Early in the last week, Oil prices advanced to their higher levels since Nov, Driven by fundamentals like turmoil in Libya, Ongoing OPEC cuts and U.S sanctions on Iran and Venezuela. However renewed concerns over rising U.S inventories and production as well as slowing global economic concerns capped the gains in the middle of the week. On Friday, Prices were underpinned by stronger than expected China's exports data. Turning to weekly data, Baker Hughes reported that U.S drillers added another 2 rig numbers. Now it is the decision time to chase the market or play for pull back. Analysts are in the opinion that the short term correction is expected. Weekly data may spur some volatility during the week. Asian markets are opened up today. Good day to all.